Is it school policy or a violation of the first amendment? A parent of a Los Gatos student is claiming his daughter was punished by a teacher for making the choice to participate in Wednesday’s National School Walkout, a choice that both the principal and the superintendent of the school district emphasized would not have any punishments. The father, who has asked to be referred to as “Richard”, says his daughter's science teacher gave the students a pop quiz at the time of the walkout to keep students from participating because he was opposed to it. “Never pull a pop quiz and penalize the kids that wanted to exercise their First Amendment rights,” said Richard. The student told her parents she tried to finish as much of the quiz as possible before the beginning of the walkout but the teacher wouldn’t take it. “The teacher did not accept [the quiz] and did not give her any credit for any of the answers she had put down,” explained Richard. Since the teacher tried to infringe their daughter’s rights, Richard says they’re pulling her out of the class and appealing her grade. The school will not comment on the allegations, citing privacy and personnel issues but the principal emphasizes a neutral position on the walkout. 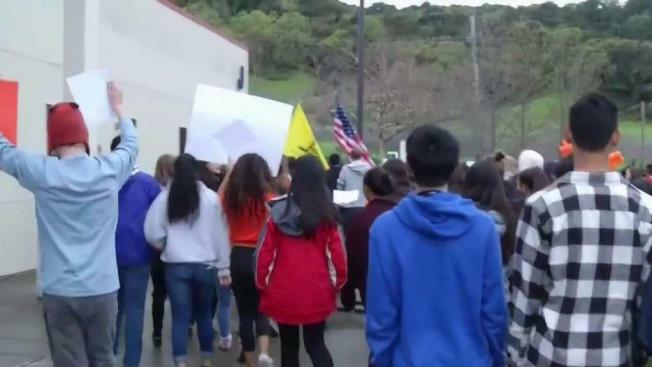 “I did instruct teachers and school staff to not penalize any students who chose to walk out or give extra credit to anyone who did,” said Los Gatos School District Superintendent and Principal, Corey Kidwell. NBC Bay Area has tried to get in contact with the accused teacher but has yet to reach him.